During the unusually cold weather of the past week, I was visiting family and friends in San Diego so I couldn’t watch nighttime temperatures fall to the twenties and sometimes the teens. 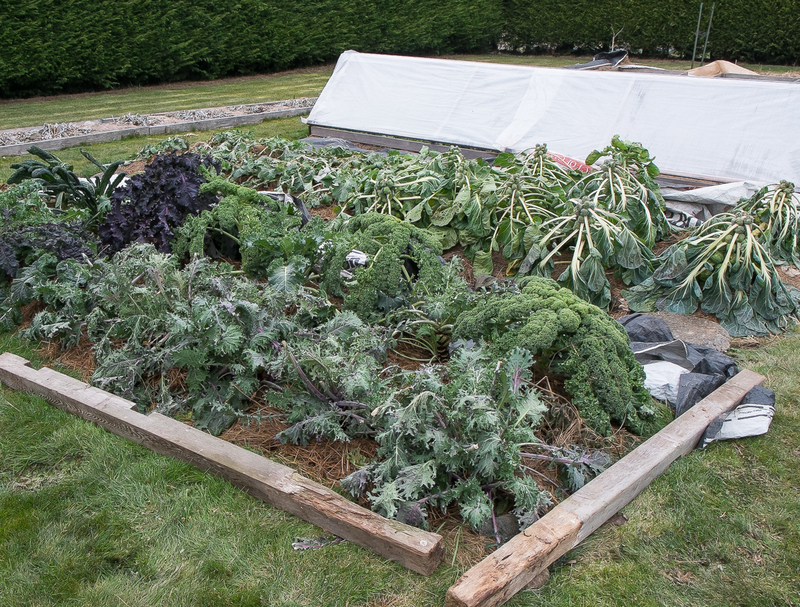 Instead, I was anxious from a distance, reading the weather report and hoping that the extra layers of mulch and the final cover of lumber wrap I’d added before we left were protecting the kitchen garden winter vegetables from damaging cold. I’m home now and grateful to find that the roots and kale, leeks and Brussels sprouts, mache and even some of the arugula and mustard are OK, all a bit battered but OK.
We can continue to enjoy roasted rutabagas, turnips, carrots and parsnips, roasted leeks, sautéed Brussels sprouts, braised kale and celery root salads with hardy greens. And I do enjoy all of them, but I keep thinking of the salad that our friend Mary served us one lunchtime in San Diego: sweet, crisp slices of bright orange Fuyu persimmons scattered with ruby red pomegranate seeds, walnuts and fresh cilantro, dressed with lime vinaigrette. It was gorgeous and incredibly delicious. I can’t get it out of my mind. This is local winter food in Hardiness Zone 10B. It’s hard not to be envious. 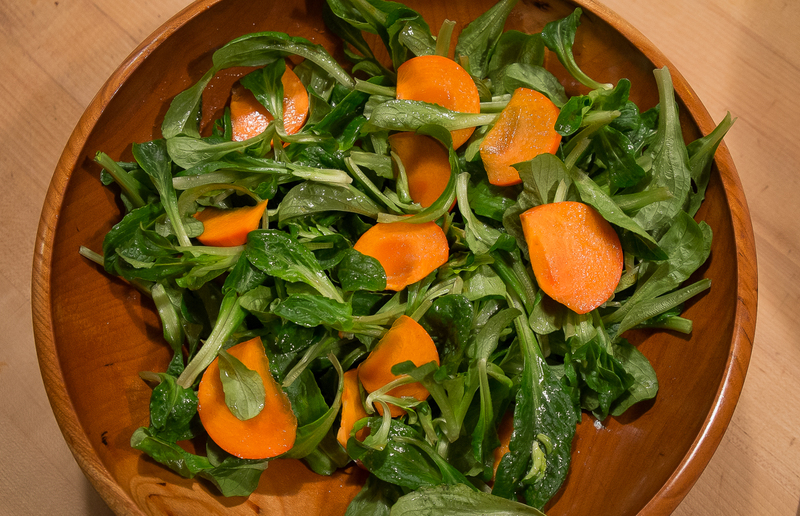 Of course a salad of mache with bits of roasted rutabaga and red apple is pretty and delicious too, a nice winter salad for Hardiness Zone 7B, but those persimmons were special. Mary gave me a couple to take home and add to my own salad. Mine was tasty but not so delicious as hers was. So I’ve gone to the Raintree Nursery site to see what persimmon varieties they offer for the northwest. There are one or two that might work. We are entering that dreamy time of seed ordering and the New Year’s garden planning so why not imagine it? 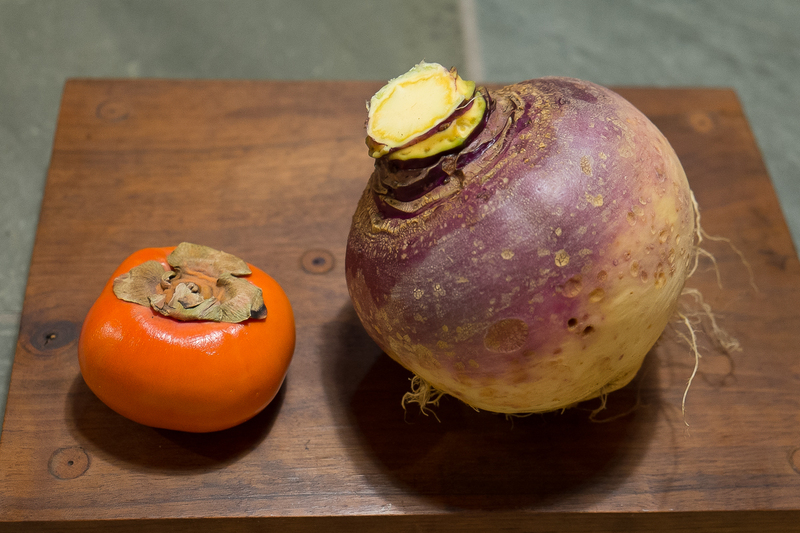 And if I don’t get a persimmon tree or two, there are always rutabagas or even better another winter visit with Mary. As one of my friends emailed the night before Thanksgiving, “Setting a nice table is so satisfying, like creating art!” It is satisfying unfolding the tablecloth, folding the napkins, polishing glasses, flatware and candlesticks, setting out plates and, most pleasing task of all, making a centerpiece. For the past few years, I’ve spread some combination of fruits and vegetables down the center of the table, anchoring the arrangement with candles. 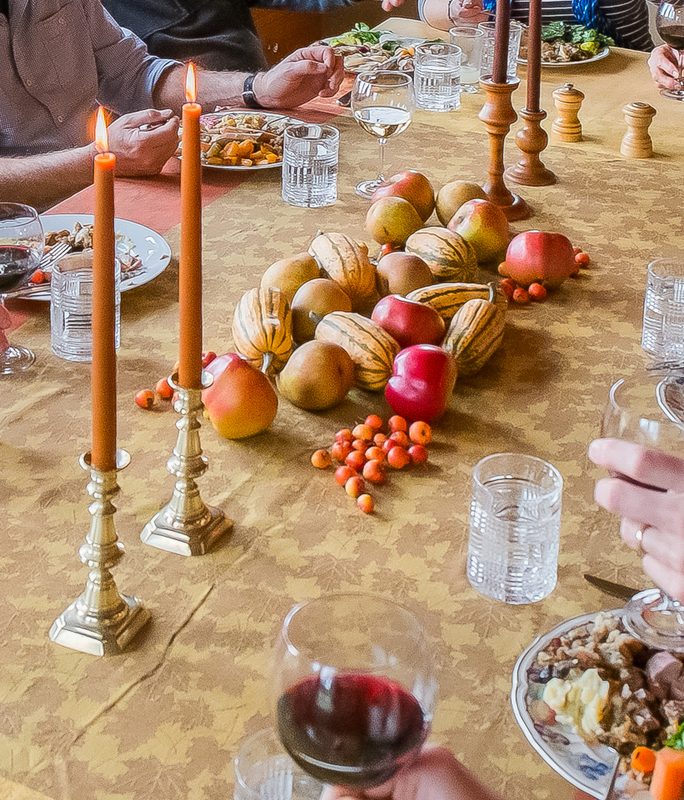 As I do, I think back to childhood Thanksgiving dinners at my grandparents and one particular shallow glass bowl piled with oranges and apples, purple grapes spilling out over the edges, walnuts scattered around the base, candles to either side. On our table this year our Melrose and crab apples, Comice pears and Delicata squash and my grandmother’s brass candlesticks carry on this tradition of a harvest centerpiece to welcome the friends and family. Thanksgiving is the first of many dinners of the holiday season. I’m looking forward to creating more pretty tables but even more to sharing food and celebrating the season with people we love.